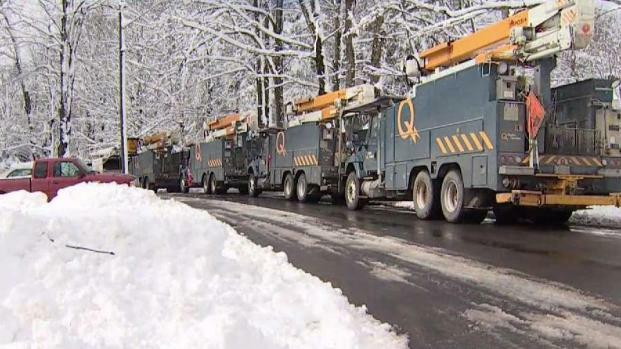 Some Westchester customers may not get electricity back until Wednesday after a nor'easter toppled trees and power lines across the tri-state. Wale Aliyu reports. About 200,000 people across the tri-state were still without power on Saturday night after a powerful nor'easter pummeled the region with snow, fierce winds and flooding downpours. Although most customers are expected to get their power back this weekend, some likely won't be restored until Monday or Tuesday. At the height of the storm, more than a half a million customers were without power across New York, New Jersey and Connecticut. "We thought it was going to be another quick one and melt but apparently everyone was caught off guard — most of the area is out of electric," James Dinapoli, of Rock Hill, said. Sami and Donna Sayegh planned on leaving their Greenburgh home Saturday night because it’s too cold there without electricity. 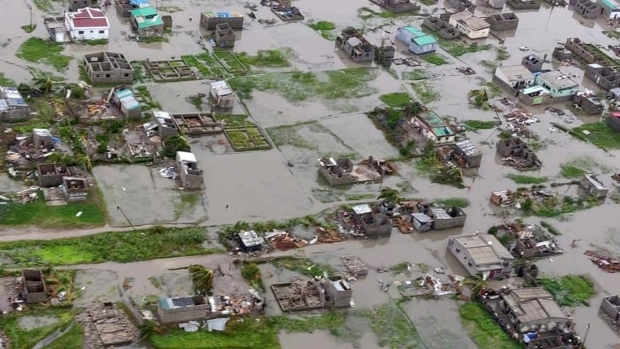 Some hotels were completely booked with residents. 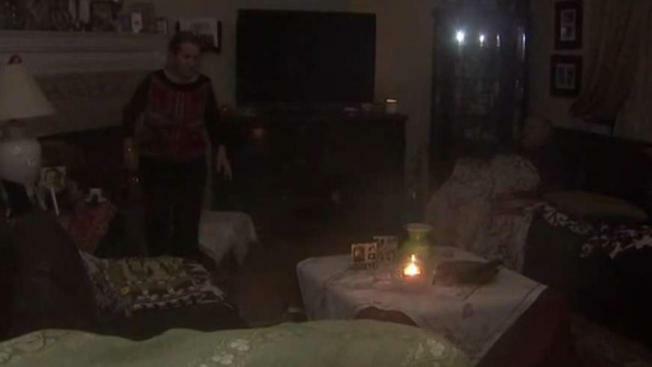 “It’s frustrating, because when we called yesterday, when we called Con Ed, they said that all the power outages will be resolved by 5 p.m. on Saturday, and now we’re not getting power until possibly Tuesday or Wednesday,” Donna Sayegh said, wrapped in a blanket. 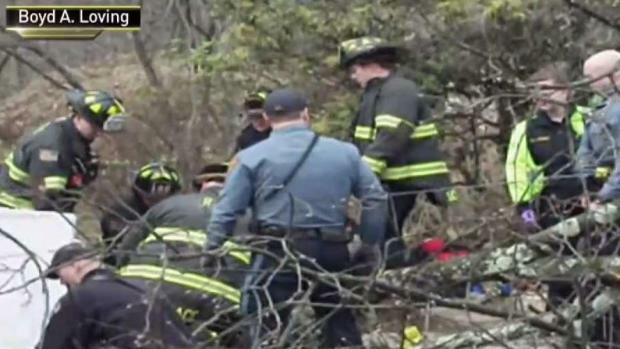 A woman was walking her dog in Hackensack when a giant tree came crashing down on her. She's recovering at a hospital after a miraculous rescue. Michael George reports. On Saturday night, more than 108,000 Jersey Central Power & Light customers were still without power. In Sussex County alone, 40 percent of JCP&L customers were in the dark. PSE&G said 6,000 of its New Jersey customers were still without electricity out of more than 184,000 impacted by the storm. Meanwhile, Con Edison reported more than 60,000 of its customers didn’t have power in Westchester. More than 6,000 New York City Con Ed customers were without power, along with another 6,000 on Long Island. PSEG said 8,000 of its Long Island customers were suffering outages. At the height of the storm, more than 128,000 PSEG customers on the island had lost power, the utility said. In Fairfield County, more than 8,000 Stamford Eversource customers were waiting for the electricity to return Saturday night. The utility Central Hudson said the nor'easter was one of the most powerful storms to hit its customers in a half century. The utility has restored electricity to over half of the nearly 110,000 of its customers who lost power in Friday's storm. It said it hoped to have most power restored by Wednesday. The storm knocked down hundreds of trees and power lines across the tri-state, including in Greenburgh, where Town Supervisor Paul Feiner said Con Ed’s priority has been opening roads and addressing low-hanging wires that are sometimes live. “I realize this is really traumatic for a lot of people. There’s people that have medical problems,” Feiner said. Friday’s storm killed at least one person in New York, an 11-year-old boy in Putnam County who died when high winds caused a tree to crash down onto his home. The nor'easter was also blamed on the death of a 41-year-old man in Andover Township, New Jersey, who police say came in contact with a downed power line and was electrocuted Friday evening. Seven other people from Virginia to Rhode Island also died because of the storm, officials said. Residents of Union Beach, New Jersey, had to maneuver around rising floodwaters a day after a nor'easter pounded the coast with torrential rain and powerful wind. Brian Thompson reports. Gov. Andrew Cuomo said Saturday that he would begin deploying 100 New York National Guard members and 30 vehicles out of Camp Smith in Westchester to assist with storm recovery in the four hardest hit counties — Dutchess, Putnam, Westchester and Sullivan. Crews in New York City began clearing more than 750 trees that were toppled, mostly in the Bronx and Queens, the mayor's spokesman Eric Phillips said. On Long Island, the town of Hempstead said it had already removed more than 100 downed trees in less than 24 hours. The storm dropped 13 inches of snow in parts of New York's Orange County, more than 8 inches in New Jersey's Passaic County and 5 inches in Connecticut's Fairfield County. New York City saw 2 to 3 inches of rain. Sullivan and Orange counties were among the areas hardest hit by snow – some spots got more than a foot of the white stuff. Heavy trees were shoved onto roadways and powerlines collapsed. 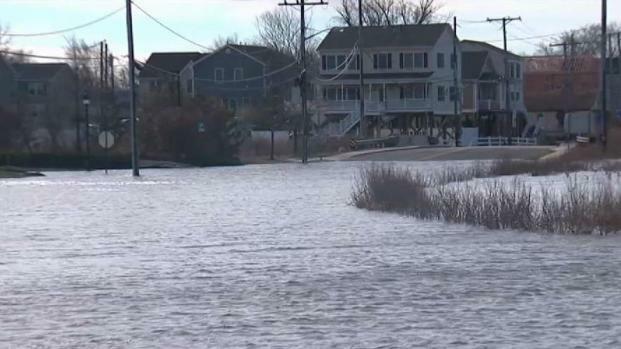 On the Jersey Shore, high tide brought water into roadways, making them impassable. In Union Beach, vehicles had to turn around when they found a stretch of roadway completely inundated. Sullivan and Orange counties were among the areas hardest hit by Friday's nor'easter. In some communities, residents are clearing more than a foot of snow. Ken Buffa reports. The tri-state's major airports are continuing to recover from a storm that forced the cancellation of hundreds of flights a day earlier. Nearly 500 flights were cancelled at Kennedy Airport. The airport reported that another 70 flights were cancelled by early Saturday. By Saturday afternoon, LaGuardia Airport had average delays of less than 15 minutes. Newark Airport, where over 500 flights were cancelled Friday, reported Saturday afternoon that some arriving flights were delayed an average of 45 minutes due to high winds. The storm crippled commuter transit across the region and train service delays continued into Saturday. Amtrak resumed modified service between New York and Washington, D.C., on Saturday. The Keystone Service, which runs between New York and Harrisburg, Pennsylvania, was operating on a modified schedule. Long Island Rail Road suspended the West Hempstead branch due to a fallen utility pole. The rest of LIRR trains had resumed service with residual delays. A polar bear plunge in North Hempstead was canceled due to rough water from the nor'easter, Newsday reported. The swim was intended to raise money for the Special Olympics. Hoboken’s LepreCon went on as planned.